Non-invasive high-frequency oscillatory ventilation (NHFOV) consists of the application of a bias flow generating a continuous distending positive pressure with superimposed oscillations, which have constant frequency and active expiratory phase. NHFOV matches together the advantages of high-frequency ventilation (no need for synchronisation, high efficacy in removing CO2) and nasal continuous positive airway pressure (CPAP) (non-invasive interface, increase in functional residual capacity allowing oxygenation to improve). There is enough clinical expertise demonstrating that NHFOV may be tried in some selected cases, in whom CPAP or conventional non-invasive ventilation have failed. Nonetheless, there are no clear data about its clinical usefulness and there is a need for randomised controlled studies. Our purpose is to review the physiology and biological effects of NHFOV, to present the current clinical evidence on its use, to provide some guiding principles to clinicians and suggest directions for further research. High-frequency oscillatory ventilation in intubated neonates (HFOV) is frequently used in neonatal and paediatric critical care.1 ,2 Nonetheless, the clinical management for neonatal respiratory distress syndrome (RDS) has evolved towards a non-invasive approach using continuous positive airway pressure (CPAP) or various types of non-invasive ventilation (NIV): thus, an early application of nasal CPAP is nowadays recommended both in Europe3 and in the USA.4 The experience in the use of invasive HFOV and the recommended non-invasive approach has somehow pushed clinicians to combine both concepts. Theoretically, non-invasive HFOV (NHFOV) should provide the advantages of HFOV (no need for synchronisation, high CO2 removal, less volume/barotrauma) and nasal CPAP (non-invasive interface, increase in functional residual capacity allowing oxygenation to improve). Thus, NHFOV could be useful to avoid invasive ventilation and its complications. Moreover, given the HFOV physical characteristics, NHFOV could hypothetically be more efficient than other types of noninvasive respiratory support in certain clinical conditions. NHFOV has been tested in some bench and animal studies, while small clinical studies have also been conducted. However, given its simplicity, the use of NHFOV has increased and it is now quite often used in daily neonatal intensive care unit care, especially in Europe5 and Canada,6 even though no clear evidence exists about its clinical usefulness. The aims of this paper are to review the physiology and biological effects of NHFOV, to present the current clinical evidence on its use, to provide some guiding principles to clinicians and to suggest directions of further enquiry in this area. NHFOV consists of the application of a bias flow generating a continuous distending positive pressure with oscillations superimposed on spontaneous tidal breathing, through a non-invasive interface. The oscillations have constant frequency and active expiratory phase. 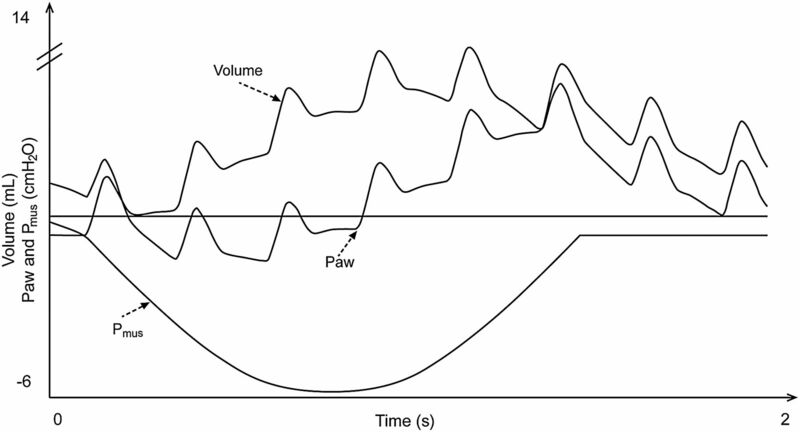 Bubble CPAP, which is known to improve gas exchange, provides a similar constant positive pressure with oscillations, but the latter are much smaller, irregular (as they have multifrequency patterns) and lack an active expiratory phase.7 Moreover, during NHFOV, mean airway pressure (Paw) may reach higher values than during bubble CPAP. This is possible because NHFOV is produced with a ventilator instead of a simple water valve and because the risk of possible air trapping-induced CO2 retention could be avoided by the superimposed high-frequency oscillations. Other types of high-frequency ventilation have been used in neonatal critical care, such as non-invasive high-frequency percussive ventilation (NHFPV) or high-frequency jet ventilation. They differ in relation to the expiratory phase and other basic physical characteristics. Even if there is no wide consensus about the value of the active expiratory phase, we prefer to focus on HFOV in this review. In intubated patients ventilated with HFOV, oscillations deliver a small volume, which is the main determinant of CO2 removal.11 During NHFOV, spontaneous breathing is maintained and oscillations are superimposed on the airway pressure changes due to tidal breathing. We studied the interaction between spontaneous breathing and oscillations modifying a bench model designed for adult ventilation studies;12 we used a neonatal or paediatric mannequin and an adequate lung simulator. An example of pressure and volume tracing obtained in the neonatal bench model of NHFOV is given in figure 1. When simulating infants beyond neonatal age under full face-mask-delivered NHFOV, both tidal and oscillatory volumes contribute to gas exchange and there is a correlation between them; moreover, oscillation transmission is the variable more significantly influencing ventilation.13 ,14 Gas exchange during HFOV is not completely understood and includes several phenomena.15 However, bench data recently confirmed that NHFOV is able to wash out CO2 from the upper airways' dead-space.16 Thus, NHFOV and tidal breathing may impact on CO2 removal at different levels and this may create a synergistic effect. Effect of non-invasive high-frequency oscillatory ventilation (NHFOV) during spontaneous breathing on pressures and volume in a neonatal bench model. Pmus is the negative inspiratory muscle pressure spontaneously generated by the patient, Paw indicates the airway pressure. Data have been generated using a bench model modified from adult setting12 consisting of a neonatal mannequin ventilated through a nasal mask and whose trachea had been connected to an electronic active test lung (ASL5000; Ingmar Medical, Pittsburgh, Pennsylvania, USA). A Sensormedics SM3100A oscillator (Carefusion, San Diego, California, USA) was used. Data were filtered at 100 Hz and measured at the lung simulator using a specific software (ICU Lab rel.2.3; KleisTEK Advanced Electronic System, Bari, Italy). A normal term neonate with no lung disease (birth weight: 3 kg, resistances: 80 cmH2O/L/s, compliance 1 mL/cmH2O/kg) at a respiratory rate of 30 breaths/min has been simulated. A single spontaneous breath is shown. NHFOV parameters were as follows: mean airway pressure 6 cmH2O; ΔP 40 cmH2O; frequency 5 Hz, inspiratory time 50%. The choice of the interface should balance two goals: achieving a satisfactory comfort and reducing dampening and pressure loss. Clinical studies published so far mostly used single, long, high resistive nasopharyngeal tubes. However, bench studies demonstrated that the use of binasal short prongs is technically feasible and can provide efficacious ventilation.18 ,19 Most importantly, such prongs are the most common interface since they are recommended over single nasopharyngeal tubes to deliver CPAP. In fact, they reduce leaks from the counter-lateral nostril and provide lower resistance,20 although nasopharyngeal tubes may have wall compliance lower than nasal prongs. However, even among short binasal prongs there may be different mechanical properties. All these factors might influence the efficiency of NHFOV and further studies will be needed to clarify these issues. There are no bench mechanical studies about nasal-mask-delivered NHFOV. Masks are likely to dampen oscillation transmission as it happens for infants beyond neonatal age;13 however, nasal masks are at least as efficacious as binasal prongs in delivering CPAP.21 Nasal-mask-delivered NHFOV has been used in clinical practice and seems suitable also for NHFOV (see online supplementary video file). In summary, interfaces have different mechanical properties, so different interfaces may be needed in different moments and for different patients; changing the interfaces serially might also be useful to reduce the risk of skin injury in case of long-lasting application. The presence of high-frequency oscillations eliminates the need to synchronise mechanical ventilation. This is an advantage given the difficulties in achieving good synchronisation during neonatal NIV and because a poor patient-ventilator interaction may significantly decrease ventilation efficiency.22 Interestingly, an animal study showed that, in contrast to non-invasive pressure support ventilation, NHFOV did not induce phasic inspiratory glottal constriction and conversely did not decrease inspiratory glottal dilatation.23 Thus, patient-ventilator interaction could be better during NHFOV than with conventional NIV. However, the same study showed suppression of central respiratory drive when nasal-mask-delivered NHFOV was applied at 4 Hz.23 This effect was not mediated by hypocarbia and could be linked to several phenomena, such as an increase in vagal pulmonary stretch receptor activity24 or thoracic wall afferent activity.25 Inflammation, pain or discomfort could have impacted as well.26 Conversely, other authors showed that nasal-mask delivered high-frequency oscillations stimulate respiratory effort in adult patients with central sleep apnoea.27 Therefore, the effects of NHFOV on spontaneous breathing pattern may be complex and would need further physiological studies. Two animal studies recently showed increased surfactant protein-B production and better alveolarisation in preterm lambs treated for 3 weeks with NHFPV.31 ,32 These studies might ideally represent a neonate developing bronchopulmonary dysplasia (BPD), but NHFPV is a different type of high-frequency ventilation, thus these data should be cautiously interpreted with regard to NHFOV. Another study showed that surfactant-untreated rats ventilated with invasive HFOV for 2 hours had larger surfactant aggregates, better oxygenation and greater lung compliance compared with surfactant-untreated animals under conventional ventilation.33 This study could reproduce the early phase of neonatal RDS before surfactant administration. Despite the limitations of these models, these data allow to speculate that, if high-frequency oscillations are applied before surfactant replacement (eg, using NHFOV in non-intubated babies during the early phase of RDS), surfactant function could be improved, although this remains hypothetical. Regarding the effects linked to a non-invasive interface, it is conceivable that having an oscillating interface on the skin could produce some local reactions or skin injuries, but this has never been studied, and a European survey has not described skin injuries among the side effects of NHFOV.5 Early HFOV has been claimed to be less pro-inflammatory than conventional ventilation34 and one could imagine the same effect for NHFOV as compared with conventional NIV. However, there are no data available on this issue, which remains difficult to be investigated. No randomised clinical trial about NHFOV has yet been conducted. 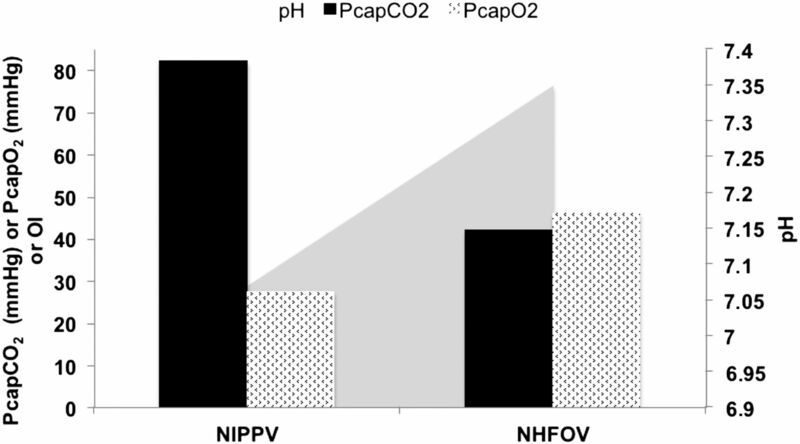 The first application of NHFOV dates back to 1998 by van der Hoeven et al.35 They reported a case series of 21 neonates with various respiratory conditions switched from CPAP to NHFOV and described a significant improvement in PaCO2 with slightly improved pH. Paw was also significantly increased switching from CPAP to NHFOV, although no data were provided about oxygenation. These authors did not actually apply NHFOV, as a flow-interruption device provided oscillations instead of an actively oscillating piston; the same applies for some other preliminary investigations and details of studies are provided in table 1. The first extremely preterm neonate successfully ventilated with NHFOV was reported in 2000,36 and another three extremely preterm neonates were recently ventilated with NHFOV through binasal prongs with satisfactory results.37 Colaizy et al38 published a non-randomised longitudinal, before-and-after, study enrolling 14 preterm infants in the recovery phase of RDS. These authors were able to confirm the reduction in PaCO2 and consequent pH improvement after 2 hours of NHFOV. Similar effects were described in a small randomised crossover trial enrolling adults, with acute hypercapnic respiratory failure treated with face-mask-delivered NHFOV, although this was only published in abstract form.39 Another German case series suggested the possible usefulness of NHFOV for extremely preterm babies at high risk of extubation failure.40 Finally, in 2014, a Canadian network of four neonatal units published the largest series of NHFOV-treated neonates so far.6 This uncontrolled study involved 52 neonates for a total of 79 instances of NHFOV. These patients were given NHFOV predominantly because of hypoxemic spells and/or gas exchange derangement. The authors suggested that the number of spells decreased within the first 6 hours of NHFOV and that 58% of patients were successfully transitioned to conventional NIV after a period of NHFOV. Need for oxygen and PaCO2 also improved. Dumas De La Roque et al42 conducted a randomised study about NHFPV for transient tachypnoea of the neonate. This is the only randomised study in this area and NHFPV turned out to be superior to CPAP in terms of duration of tachypnoea and respiratory support. However, as stated above, NHFPV is a completely different mode of respiratory support and these results cannot be directly applied to HFOV or to neonates with RDS or BPD. A European survey described a huge span in terms of Paw, ΔP and frequency.5 Available studies reported the use of NHFOV in postextubation phase with a Paw of 8 and ΔP ≤25 cmH2O40 or in stable neonates with Paw at the same level of CPAP that babies were previously receiving and ΔP titrated to obtain visible chest oscillations.38 Since CO2 elimination under NHFOV is also provided in the upper airway dead-space,16 it is probably unnecessary to increase ΔP to achieve a visible chest oscillation. Neonates developing BPD might also benefit from NHFOV. In fact, they may have a mixed, restrictive/obstructive pattern causing hypercarbia/hypoxia.43 Thus, these babies need high Paw, which is rarely achievable with conventional NIV and a risk of gas trapping exists: this might be greatly reduced by NHFOV-induced upper airway washout. To illustrate the practical setting, an online supplementary video file shows a neonate of 25 weeks gestation under nasal-mask-delivered NHFOV with satisfactory comfort and clinical stability. Figure 2 illustrates clinical data for this patient. Physiological parameters from a neonate developing bronchopulmonary dysplasia and ventilated with non-invasive high-frequency oscillatory ventilation (NHFOV). This was a neonate of 25 weeks gestation, at 35 days postnatal age, who developed severe respiratory acidosis, under non-invasive positive pressure ventilation (NIPPV), after surgical ligation of a haemodynamically significant ductus arteriosus. Data from arterialised capillary blood gas analyses performed after 2 hours of maximal NIPPV (peak pressure 25 cmH2O, PEEP 5 cmH2O, rate 60 breath/min, inspiratory time (IT) 0.5 s, flow 8 L/min) and 2 hours after a change to NHFOV (at Paw 15 cmH2O, ΔP 45 cmH2O, frequency 10 Hz, IT 50%). Oxygenation index was 16 and 10, after 2 hours of NIPPV and NHFOV, respectively. Particular nursing care was applied to reduce leaks and increase patient's comfort (see online supplementary video file). Patient remained under NHFOV for 8 days before being shifting back to NIPPV: no invasive ventilation was needed and no particular problems were noticed. Black and hatched columns represent capillary arterialised blood gases (PcapCO2 and PcapO2). The light grey triangle in the background indicates the improvement in pH. To summarise, according to the clinical experience accumulated so far, we believe that Paw could be set at values higher than those usually provided with conventional NIV (table 2). More extreme values are not advised either because of unavoidable leaks or because effects on patient's comfort and respiratory pattern are still unclear. NHFOV has been subjected only to bench and animal investigations, as well as small, uncontrolled clinical studies. Bench studies are still needed to clarify mechanical properties of nasal masks and different prongs. Conversely, further animal studies are probably unnecessary: in fact, NHFOV is likely to be safe and we now need to better clarify its clinical usefulness. To achieve this goal a pilot study is recommended, focusing either on infants postextubation or those at risk of developing BPD. Then a large, multicentre, randomised, clinical trial should be conducted having as outcomes the duration of respiratory support, ventilator free days or similar end points. Harder outcomes, such as BPD, mortality and long-term respiratory function might also be considered as secondary end points. Such a trial has not yet been conceived and might be problematic in terms of funding. In fact, a recent analysis shows that about 50% of the neonatal ventilation trials have been conducted without any funding,46 appropriate investments are warranted by research funding agencies and/or the industry. Table 3 shows all the currently ongoing trials on NHFOV: four trials are listed in ClinicaTtrial.gov, while none appears in the International Standard Randomised Controlled Trial Number Registry or in the Australian-New Zealand Clinical Trials Registry. Unfortunately, none of these trials follows a multicentre design and their power is unknown. Another European multicentre trial, aiming to provide NHFOV as primary respiratory support starting at birth has not yet started (P. Rimensberger, personal communication 2015). While waiting for adequate randomised controlled trials, given the possible usefulness of NHFOV from a pathophysiological point of view and its relative easiness of use, one may consider its application on a case-by-case scenario after risk/benefit ratio evaluation. The authors are grateful to Peter C Rimensberger, MD, PhD (University Hospital of Geneva, Switzerland) and Tom Leenhoven for sharing ideas about NHFOV and for the critical review of this manuscript. The authors are also grateful to Ascanio Tridente, MD for linguistic revision of the manuscript. Finally authors thanks Luigi Bertogalli for the help in preparing the vectorial graphics.
. Nasal continuous positive airway pressure (CPAP) for the respiratory care of the newborn infant. Respir Care 2009;54:1209–35.
. Oscillation transmission and ventilation during face mask–delivered high frequency oscillatory ventilation in infants: a bench study with active lung simulator [abstract]. Arch Dis Child 2012;97(Suppl 2):A117–18.
. Gas exchange in healthy rabbits during high frequency oscillatory ventilation. J Appl Physiol 1989;66:1343–51.
. Neuromuscular blockade enhances phrenic nerve activity during high-frequency ventilation. J Appl Physiol 1984;56:31–4.
. Effects of high-frequency pressure waves applied to upper airway on respiration in central apnea. J Appl Physiol 1992;73:1141–5.
. Lysophospholipid and fatty acid inhibition of pulmonary surfactant: nonenzymatic models of phospholipase A2 surfactant hydrolysis. Biochim Biophys Acta 2005;1720:1241–8.
. Effects of oscillatory devices during noninvasive mechanical ventilation in acute hypercapnic respiratory failure (AHRF). A clinical pilot study [abstract]. Intensive Care Med 2010;36(Suppl 2): S109. Contributors DDL wrote the first paper draft and no honorarium was provided for that. DDL conceived the paper and both the authors participated in its preparation. DDL provided and analysed data from previous unpublished bench experiments. VDO performed bibliographic research and both the authors analysed the literature data. VDO also provided and prepared clinical data of illustrative case and took care of the online supplementary video contents. Both the authors reviewed the manuscript for important intellectual contents and approved the final version.